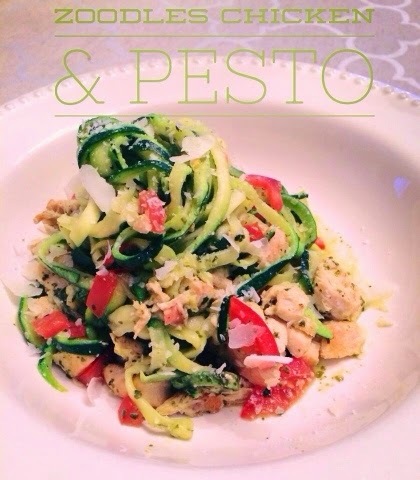 Use a Vegetti or spiralizer to turn your zucchini into noodles, zoodles! Sautée zoodles in a nonstick pan with a bit of non-stick spray. Once cooked, 3-4 minutes, add 2tsp of pesto, 4oz of grilled chicken, 1 diced Roma tomato, 1/2 clove of minced garlic, and a pinch of sea salt. Mix together in the pan over heat before plating. Add a sprinkle of Parmesan cheese. ENJOY! !